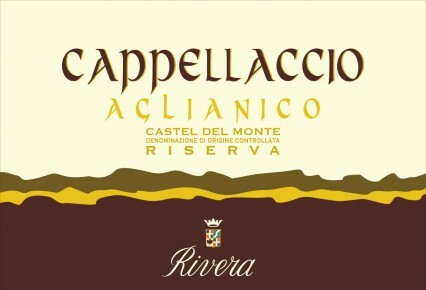 Rivera’s Cappellaccio expresses the full potential of Aglianico grown on the limestone hills of the DOC Castel del Monte. It takes its name from the thin and hard calcareous crust that is found at around 50 cm under the limestone soils of the Castel del Monte DOC area and that has to be broken in order to allow vines to be planted. Located at an altitude of 200 meters, the vines are trained in the spurred cordon system, at 4,800 vines per hectare. Average yield is 90-100 quintals per hectare. Its important structure is refined from aging in French oak for 12 months (50% barrique, 50% botti), balanced by fresh acidity typical of the variety. Ad additional 12 months in bottle allows its varietal characteristics to fully develop. This is a beautiful wine with a great sense of depth and power: dark fruit nuances are followed by plum, blackberry jam and dried cherry. Its elegant bouquet, harmonious and complex make it suitable to accompany savory meat (brisket with BBQ sauce, barbecued beef, smoked pork, beef stew, chili con carne), mature cheeses as well as mushrooms and beans. Serve at cellar temperature. 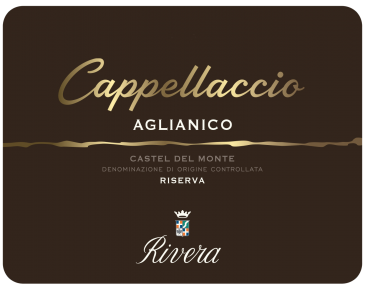 If stored properly, Cappellaccio will age beautifully for at least 8-10 years. Aglianico is one of the oldest grape varieties in the world, having been introduced to Southern Italy by the ancient Greeks about 3,000 years ago (‘vitis hellenica’ is Latin for ‘Greek vine’). This grape is now common in Campania, Basilicata and north-central Apulia. Today, its qualities are well recognized: for its elegance, ageing potential and complexity and it has been called ‘the Barolo of the South’. Maceration for 15 days at 28°C with pumpovers and delestage. 12 months (50% in French oak barriques and 50% in 50-hl French oak botti); 12 months in the bottle.